HireIQ's predictive analytics reliably predicts customer service professional tenure and performance. 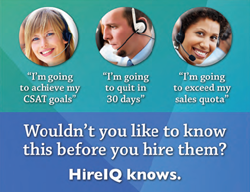 Contact center operators are constantly challenged to attract, hire, and retain a high-performing workforce and HireIQ’s products directly address that challenge. HireIQ Solutions, Inc., the innovative leader in predictive analytics and virtual talent acquisition solutions for customer-facing organizations, today announced that it is exhibiting at the 2016 ICMI Contact Center Expo and Conference. This year’s event is to be held May 10 – 13, 2015 at the Long Beach Convention Center in Long Beach, California. The International Customer Management Institute (ICMI) is the leading global provider of comprehensive resources for customer management professionals -- from frontline agents to executives -- who wish to improve customer experiences and increase efficiencies at every level of the contact center. Since 1985, ICMI has helped more than 50,000 organizations in 167 countries through training, events, consulting, and informational resources. ICMI's experienced and dedicated team of industry insiders, trainers, and consultants are committed to helping you raise the strategic value of your contact center, optimize your operations and improve your customer service. ICMI is a part of UBM plc (http://www.ubm.com), a global events-led marketing services and communications company.